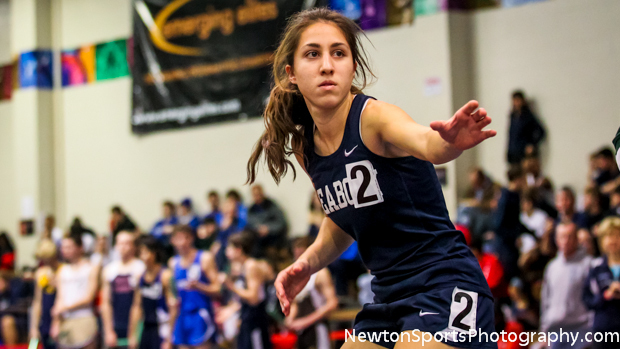 When word got out that Carla Forbes was lost for at least a large part of the indoor season, it would be difficult to blame anyone for imagining that North's demise was coming. Coach Joe Tranchita isn't that kind of guy, though, and he simply went back to the drawing board to assemble one of his most unique and interesting squads. The additions of Shannon Fitzgerald and Christina Galvano helped shore up the sprinting and jumping squads, and while they don't replace a Forbes, they proved this week that the sum can sometimes be greater than the parts if everyone is used correctly. With a 40-40 tie going into the 4x400 relay, North had two old pros in lead leg Meghan Bellerose and anchor Madi Nadeau join the newcomers in running 4:00.05, easily putting away Andover and all other contenders. While those four joined together on Thursday to run 4:06, this was the icing on a pretty special week for the Tigers, who also dispatched Weymouth 55-40 on Thursday night to gain the inside track on yet another Bay State Conference title. The story of the meet might just have been that of retribution. When North's lead leg in the shuttle hurdles false started, a pall fell over their chances, for a minute or so. Making matters worse, Andover's Courtney Comeau, Jillian Gamache, Lizz Kobelski, and Hannah Chapman (29.3) won that heat in near-record time, ahead of Brookline (30.17) and Weymouth (31.12, 4th), and better than Acton-Boxboro's 30.88 out of heat #6. Coupled with Andover's 4th place in the shuttle dash (an event won by Brockton's foursome of Nikayla Simpson, Patricia Montiero, Talia Halladay, and Reanna Allen in 24.83), the infield was going the Warriors' way. However, as North teams always seem to do, the next man up carried the day, with the 4x800 going off seconds later. Bellerose's 2:16 split sent a rift into the field, which included Lincoln-Sudbury's A (9:53.80) and B (10:05.68, 4th) teams, as well as a solid Franklin team in 3rd (9:53.84). So when the senior gave way to Maeve Greeley, Cookie Koch, and Evie Heffernan, the 9:38.14 time was 15 seconds better than the rest. After Wachusett took the sprint medley on the backs of a huge opening leg from freshman Kate Gobi, great sprints from Mariessa Ricciardi and Chelsea Owusu, and a blazing anchor leg from Amy Collins (4:14.91), only Andover's 6th place affected the meet scoring. Maya Halprin-Adams of Cambridge R&L set the tone in the race with a 2:16 opener, but the team was edged for 2nd by a strong A-B squad. The usual suspects were back at it in the 4x200, as North won in 1:46.86, with Nadeau, Galvano, and Fitzgerald being joined by senior Maeve Larkin for the win over Cambridge. Andover lurked again, taking 5th, and kept North's lead at 20-16. The distance medley might not have impacted the scoring of the meet, but it was something to watch. Peabody attacked the race early on, knowing that the meet record was in its grasp with Catarina Rocha, the runner-up at Footlocker Nationals in cross country, awaiting the stick's arrival. Rocha didn't disappoint, splitting 4:53.5, and giving Sam Allen, Heather MacLean, and Joanne Francis something to celebrate, although the meet record survived another year. The battle for second was intense, eventually stolen by Lincoln-Sudbury's (12:44) Sydney Clary, anchoring in 5:12 and outlasting Haverhill's Riley Gilmore (12:46), Lowell (12:50), and Weymouth's Ashley Betts (12:51). At this point, field event results poured in, with each team taking huge points across the board. Gamache, Chapman, and Catherine Haut combined for the long jump relay in 45'8", just .25 inches from Cambridge in 2nd. Likewise, Kobelski combined with Ryan MacRae and Melissa Shattuck to win the shot put relay in 102'6", just .75 inches ahead of the Tiger squad. However, North had a turnicate with them, taking 3rd in the long jump (Fitzgerald, Larkin, and Galvano) and that runner-up finish in the shot (Michaela Smith, she of the 41 foot fame, along with Maddie Irwin, and Angela Ward). North (13'7", 3rd) even edged Andover (13'4", 4th) in the high jump, an event expectedly won by Lincoln-Sudbury in 14'10.25". Lucy Alexander, Meghan Klapper, and Kristin Kimble give L-S a formidable team at any meet, and this win was as solid of a lock as there was in the whole meet. At this point, the meet was knotted 40-40, and the rest was history, as that fateful 4x400 would carry the day for Coach Tranchita and the Tigers. Individuals come and go, but some schools are just programs in track and field. Newton North is surely one of them, and the scary thing is, Carla Forbes will be back at some point. 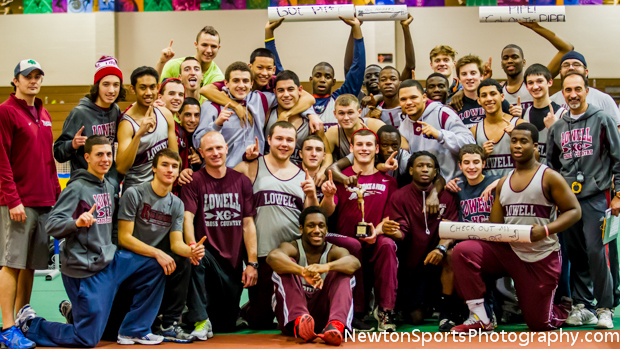 The boys meet was as close, with Lowell finding a way to win with just 31.5 points, sneaking past Cambridge and Newton North, each at 28, and Andover at 24. Had 5th place Lexington not been disqualified in the hurdles relay, they would have joined the fray as well. Lowell's road to victory was fitting for the blue-collar town with the blue collar coaches, as they chipped away, taking points in any package they could find them. A shuttle hurdles win and a 4x800 2nd place gave the Raiders the bulk of their points, but without a 5-6 finish in the distance medley, a 6th place shuttle dash, a 3rd in the shot put, a 5th place sprint medley, and a tie for 5th in the high jump, these boys would have been talking about what might have been, instead of what was. You'll be hard-pressed to have found bigger smiles than those on the faces of Coaches Ouelette, Maia, and Casey, a bunch of class acts who coach a bunch of class athletes. The shuttle hurdles win in 27.37 by Jack Galvin, Musa Mansarey, Mike Holder, and Mohammed Jones set the tone for the day, but Cambridge countered with a shuttle dash win of its own. Shaquille Anderson, Rashawn Velez, Joseph Kozlowski, and Rashawn Bryant combined to go 21.98. Of note from the infield races was that Peabody took 2nd in both, but their scoring was done for the day unfortunately. The 4x800 was next, with Mike Glennon's Brookline squad winning in 8:08.14. Aaron Klein, Will Taylor, Jesse Fainzylber, and Sam Burrington appear to be the team to beat statewide for now, and they gapped Lowell by 7 seconds. But the theme for Lowell was survive and move on, and the squad went 8:15.39 for 2nd, nosing out Axcton-Boxboro in the process. Newton North then got into the scoring mix in the sprint medley, winning in 3:37.06 on the backs of Gabe Montague's 1:55 opener, and nice runs from Nick Fofana, Jared Prior, and Ryan Lucken. Lincoln-Sudbury (3:38.50) and Andover (3:39.70) were close, and Lowell stayed in the mix in 5th. Lowell's stronghold on the meet appeared in jeopardy when Cambridge came back for the win in the 4x200, as Anderson, Velez, and Kozlowski joined Alex Kirby in 1:32.03, outlasting Xaverian by two full seconds. Andover took 4th, staying close behind. The best race to watch on the track was the distance medley, as St. John's (Shrewsbury) stacked their team of Alex Crowley, Ryan Dix, Connor Murphy, and anchor Jonathon Green, winning in 10:33.92, as Green pulled ahead of Lexington's Nat Adams in the closing laps. Lowell's gamble of tossing in two teams appeared to backfire, but those three points proved to be enormous when the dust cleared. The field event results came through at this point, with BC High winning the high jump easily in 18'4", ahead of Lexington (17'10") and Cambridge (17'5"). Newton North's 4th places here and in the long jump (55'3") gave them 8 more points, and Cambridge stayed close with 5th in long jump as well (54'11"). The long jump relay was won by Revere in 58'7", just better than Westford's 57'6". Newton North used big tosses from Carl Whitham and Nick Fofanato win the shot put (143'4") over St. John's, but there was Lowell again in third, taking 6 more key field event points. Watching the 4x400, a spectator knowing little else would have been sure that Andover had won the meet, as Humza Naveed passed L-S's anchor for the win, 3:31.76 to 3:31.85. Oliver Ebarth, Matt Reardon, and Billy Baldwin ran great legs to get Naveed to that point, and Andover got the loudest ovation of the day. But, in the end, it was those little 5ths and 6ths that added up for the win. Knowing the Lowell coaching staff, they preach that every kid on the team can count, and without a doubt, that was on display in Boston today.